(MENAFN - Gulf Times) Having spent three and half years with Al Sadd, coach Jesualdo Ferreira was desperate for the Qatar league title and the Portuguese manager was pleased to have finally led the club to domestic glory. The last time Al Sadd had won the title was in 2012-13 season, and since then Al Duhail (previously known as Lekhwiya) have gone to lift the Falcon Shield four times with Al Rayyan picking up the trophy in 2016-16. In the meantime, Sadd finished runner-up in the last two seasons, despite bringing in Barcelona great Xavi Hernandez in 2015. But the club's decision to stick with Ferreira and add quality players to their squad, while giving opportunities to young talents has worked wonders for them. Having persuaded prolific striker Baghdad Bounedjah to stay, after the Algerian had interests from Europe and the addition of South Korean Jung Woo-Young and Spaniard Gabi during the close season, Al Sadd were always going to be a strong contender. In the end, the Wolves to cruised to a record 14th league title and their 7-2 thrashing of fifth-placed Al Ahli on Thursday. Astonishingly, Sadd have scored 94 goals with a goal difference of 73 this season with a match to spare next weekend. 'This title is a deserved one for Al Sadd and we were the best team in Qatar this season. This win goes to everyone at the club, who have also worked behind the scenes, said a relieved Ferreira as the players and celebrated on Thursday. 'I can't describe my happiness. I have been with Al Sadd for three and half years and everyone players, management and the fans wanted to win the league title badly. This Falcon shield will be engraved in Al Sadd's records and we will celebrate for winning the title. Now we will start preparing for the important game against Pakhtakor in Tashkent, said the Portuguese manger, already his eyes set on the AFC Champions League on Tuesday. Midfielder Hassan al-Haydous, who grabbed two against Ahli, has been unsung hero for Al Sadd. And the Qatar captain was confident this was just the beginning of many titles the club will win over the next few years. 'Sadd deserved to win the title after putting in hard yards. It's been a long journey and our main goal this season was to win the title after a long gap. This achievement will hopefully be the beginning of titles for the club. We will continue to work with all strength and special thanks to fans for supporting us throughout the season. I also want to thank my teammates, the technical staff and the management. Everyone had only one goal and that was to win the title and we succeeded in doing that, he said. Bounedjah, who scored his seventh hat-trick of the campaign on Thursday, has scored 39 goals in 21 matches making him the all-time highest scorer in a single season. And the forward echoed al-Haydous's thoughts when he said Al Sadd can challenge for more trophies. 'I am over the moon. We wanted to win this badly. We put on a fighting spirit and played well this season. The fans and the club have waited patiently long enough for the title and I am glad we could make them happy. We will continue to win the titles and we will continue to make them happy. Sadd always enters every championship to win, and after the winning the league title our morale is high. This title will give us a great moral boost to compete for the rest of the season, he saod. On his record-breaking feat, he said. 'I am grateful to my teammates for their support. Without their help I would have not scored so many goals. But the most important thing for me was to win the title and not become top scorer. Gabi said he was proud to have won the league title in his first season with Sadd. 'I am very happy to win the league title in my first season, said Gabi. 'I am proud and happy to be a part of the Sadd family. Sadd are a big club with plenty of titles and we are looking forward to the Amir Cup and the AFC Champions League. But we need to continue to work hard for that. The team, administration, management, technical staff are working hard for the success of Sadd, said the former Atletico captain. Hani Taleb Ballan, CEO of Qatar Stars League (QSL), congratulated the Board of Directors of Al Sadd club on the occasion of their triumph in the 2018-19 season QNB Stars League. 'On behalf of all members and staff of the QSL, I congratulate the Al Sadd Club, players, technical and administrative staff as well as fans on showing excellence in the championship. The results and achievements by Al Sadd prove they fully deserved to be crowned, said Ballan. He also praised Al Duhail, who were strong contenders for the title and exhibited a high level throughout the season. 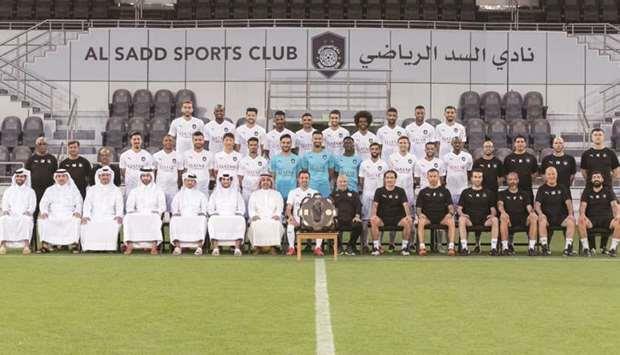 Meanwhile, Abdullah bin Hamad al-Attiyah, one of the founder members of Al Sadd, expressed his happiness after the club won the title for the first time since 2012-13 season. 'It's a great feeling that the club has won the league shield, said al-Attiyah. 'I congratulate the fans. They've been a great source of inspiration and support.